There is a season for everything, and needs to be met, specially for something as important as your wristwatch. Sometimes you need it to tell time in two time zones at once, keep track of your heart rate, or simply tell the time. On special occasions though, you need your watch to represent your style, and your appreciation of the finer things in life. Above that, you need something spectacular to own the room. Those are the days that you need to be rocking one of these on your wrist; subtlety can wait for another day. 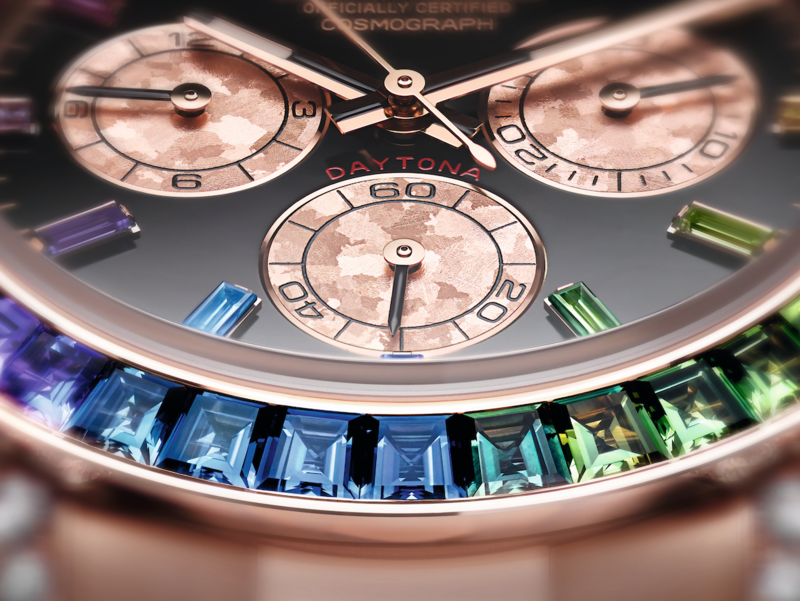 A modern-day gem-set version of the evergreen Oyster Perpetual Cosmograph Daytona, the new 18ct Everose gold version has a bezel set with a gradation of sapphires in rainbow hues in lieu of the emblematic tachymetric scale. The case is also adorned with 56 brilliant-cut diamonds set into the lugs and crown guard, and the dial features 11 baguette-cut sapphire hour markers, each matching the color of the corresponding point on the bezel. 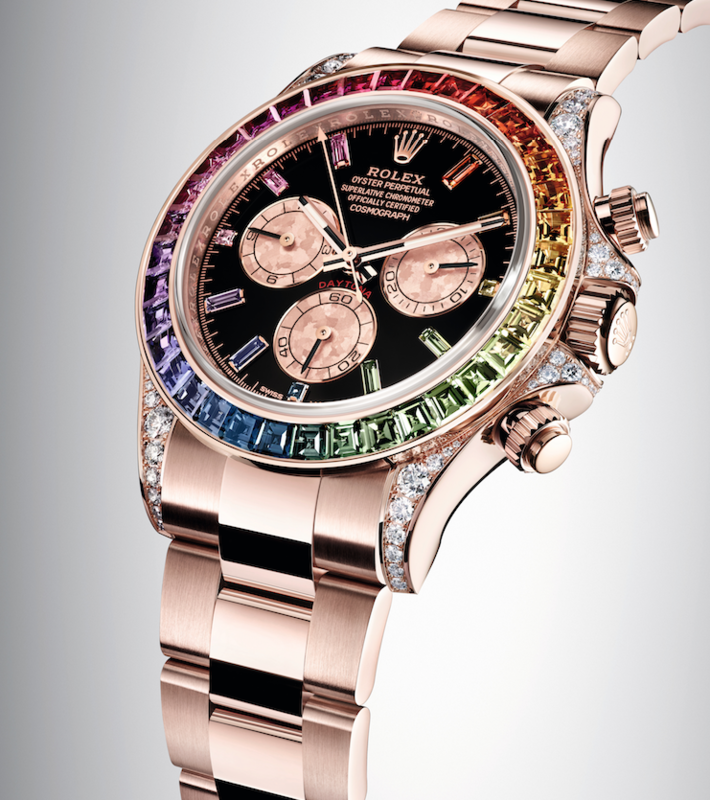 The chronograph counters are in pink Gold Crystals, a material created through a special process developed by Rolex. Rolex's own in-house gemologists and gem-setters are responsible for selecting only the highest quality stones, and then placing each one to best reveal its beauty, color and sparkle. The 36 baguette-cut sapphires on the bezel have been hand-selected for the perfect color graduation, representing the colors of the rainbow in a beautiful, almost seamless segue from one hue to the next and back again. Paired with the rock solid Oystercase, guaranteed waterproof to 100 metres, and the ultra-dependable Rolex calibre 4130 automatic movement, the Cosmograph Daytona will not fail you in any setting, be it active, or social. 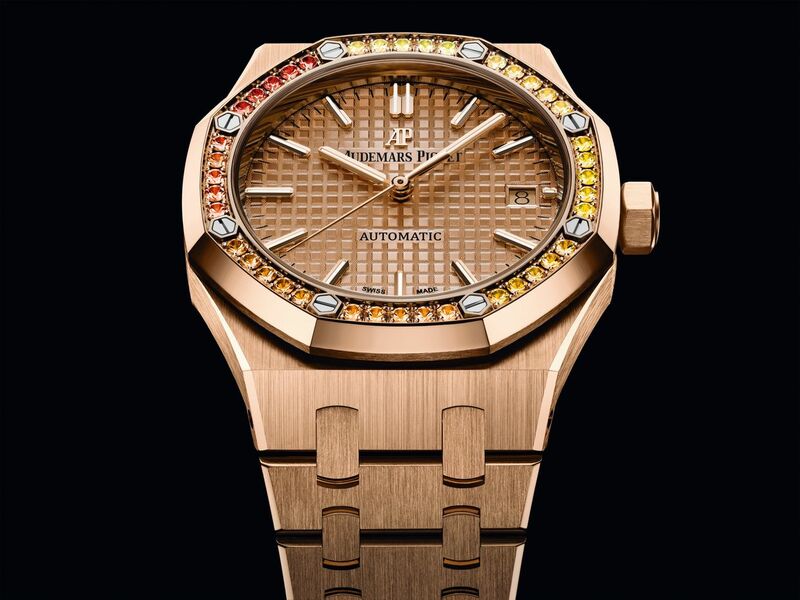 Brand new for 2018, and an addition to the ever popular Audemars Piguet Royal Oak collection, this 37mm 18ct pink gold case wristwatch features a bezel set with carefully chosen brilliant–cut orange sapphires, specifically chosen in eight different shades and meticulously graded from pale to dark for a subtly beautiful graduation around the dial. Audemars Piguet has retained the eight iconic screws on the bezel, and integrated them into the design as a point where each set of sapphires pick up a darker hue. On the face of the watch is a pink gold-toned dial with the iconic “Grande Tapisserie” pattern, pink gold applied hour-markers, and Royal Oak hands with luminescent coating. 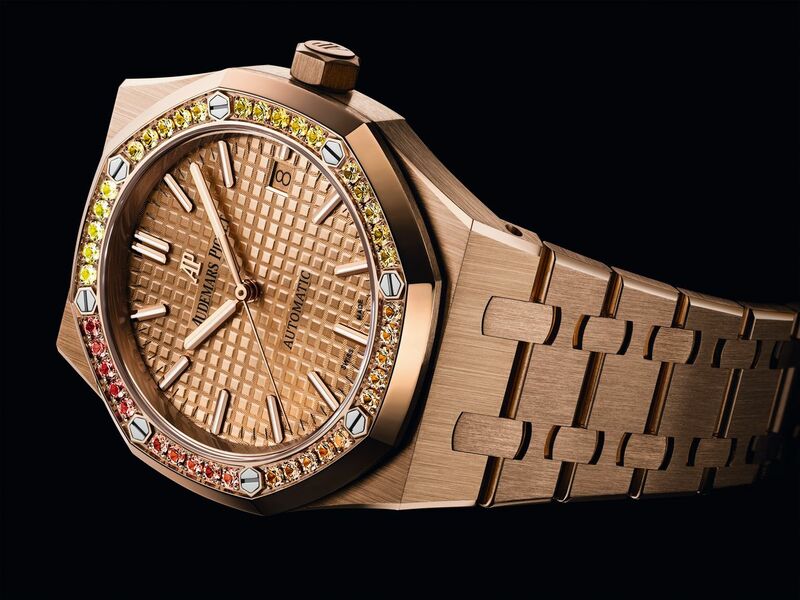 A perfect execution of balance between the luxurious materials, pink gold tones and the decades old iconic design and expectations of the Royal Oak collection. Rounding off the offering is the manufacture Calibre 3120 automatic movement with a 60-hour power reserve and is meticulously produced with a hand-decorated rotor embellished with the Audemars Piguet monogram, and the coat of arms of the Audemars and Piguet families. 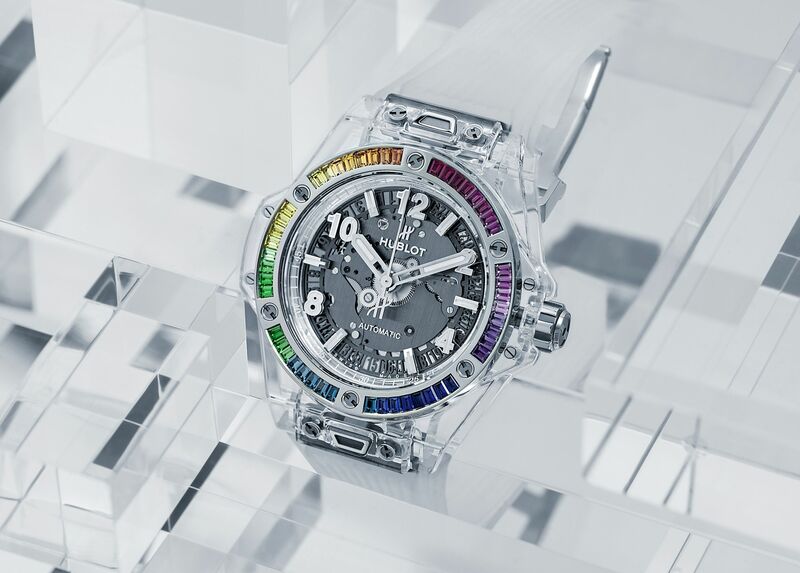 In a unique execution, in-line with Hublot’s constant search of new technical materials to incorporate into their watches, the new Big Bang One Click Sapphire Rainbow is a 39mm watch crafted out of blocks of polished sapphire crystal. This results in a watchcase that is supremely scratch-resistant and almost as hard as diamond. Above that, the case is completely clear. When paired with a monochromatic dial, it allows the colors on the bezel to really pop and take center stage. The bezel is crafted out of 18ct white gold, and channel set with 48 baguette-cut sapphires, amethysts, rubies, topazes and tsavorites that have been chosen and color-graded for a flawless gradual execution of the rainbow tones all around the bezel. 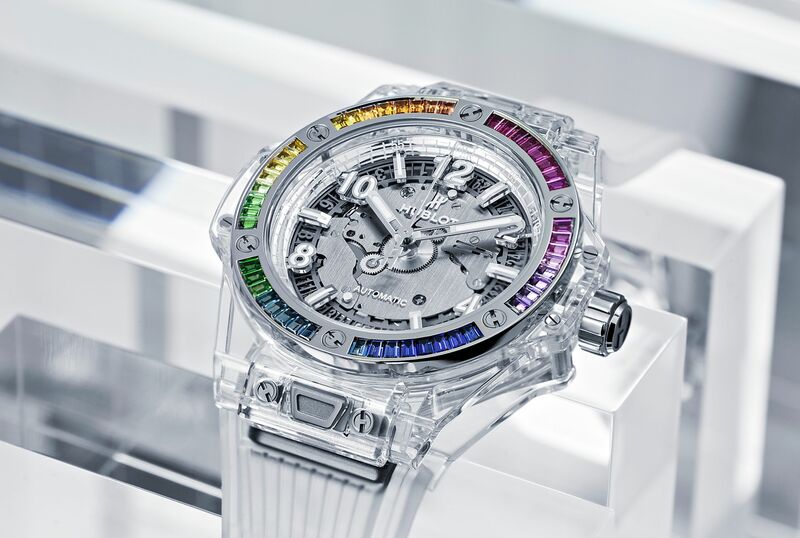 The watch is presented with a transparent structured lined strap; however, should you decide on a little extra color, the strap is easily switched out via the ‘One Click’ quick-release system heralded by Hublot. Keeping the watch ticking is the HUB1710 self-winding movement with a 50-hour power reserve. Limited to only 50 pieces worldwide, this is a striking watch fit for connoisseurs who appreciate both a high level of technical craftsmanship, as well as an aesthetic execution that is bold and modern. This balance of modern design and forward thinking material selection, paired with advanced performance and dependability, is perfectly personified with Hublot.